Pizza and beer – it’s a match made in heaven, as well as the perfect antidote to this rainy Sunday afternoon I find myself wasting away indoors. Blurb on the bottle: Hops are where it starts for the born-again craft head and Supercharger American Pale Ale is where Panhead delivers. This is an all-American show with Centennial, Citra and Simcoe overwhelming your nose, kicking you in the taste buds and departing with more bitterness than a Palm Springs divorce. Tastes like: Oh yeah, that’ll super charge my afternoon indoors. 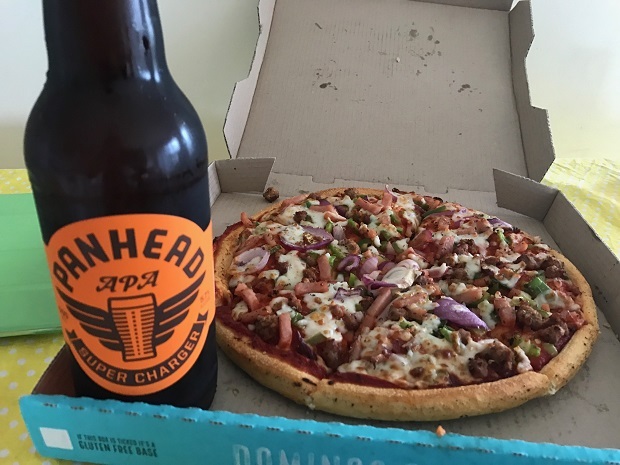 At this point in time, every single craft beer fan in New Zealand must surely have tried Panhead’s Supercharger APA, so I’m not going to waste my time going into too much detail about what it tastes, smells, and feels like. Instead, I’ll complement its hop palate, which never fails to tantalise my taste buds. It’s zesty, fresh tasting, grunty, and yet it’s never overwhelming like some APAs tend to get when there’s this much going on. I’ve also got to applaud Panhead for managing to keep the alcohol content down to below 6%. The verdict: Panhead’s Supercharger APA came out on top in SOBA’s annual beer awards last year, and this year was voted the number-one beer on GABS’ “hottest 100 craft beers” list. Although these respective beer awards are hardly Oscars, they indicate to me that a thumbs up from Best Beer HQ (the popular beer blog with 11,000 hits per month!) is not going to be worth a great deal. Beer/movie combination: Rather than trying to come up with a movie that I think would match this beer, I’ll just tell you about the one I watched while I drank it. It’s about a ponytail-less Steven Seagal, an ex-Navy SEAL working as a cook, who must stop a group of mercenaries who have seized control of a US battleship armed with nuclear weapons.